Seth had to go out of town for work, so I was on my own for dinner for a few days. I mostly had leftovers (or, um, frozen vegan chicken strips with peas, because I eat like an eight year old sometimes) for the first day or so, but since he hates mushrooms and I love them, I always make at least one meal of them when he’s away. It’s no secret that I’m completely enamored with Isa Does It, and this recipe is one of those that’s crazy easy and holy yum delicious. The marinade is very simple to modify for however many ‘shrooms you’re making. I just roast mine in the toaster oven for about 20 minutes at 400. 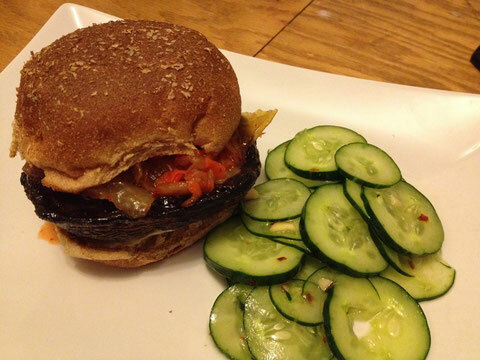 Kimchi and vegan mayo top off the “burger” and it’s so yummy. Juicy and a tiny bit messy, but so, so good. I decided to make a quick cucumber salad. I found a super easy recipe for one and modified for the half or so cucumber I was planning to eat. It turned out really good and made a nice crisp side to the spicy mushroom. Oh, and the marinade is also really good for tofu - you can make a wicked good Korean BBQ taco from it.